"Now all my contemporaries are dead, and I am the only one of them who is still here today to tell you of what life was like in the past. If you want to know the story of our origins here, I can tell you everything. Everything I say is the truth. I do not lie. I will not deceive you. I am not boasting. Everything I tell you is true. My name is Wé Salau. There is no one older than myself. There is no one else who knows the things that I know." Born of the forest and dependent on it for every aspect of their material lives, the Penan long ago embarked on a journey that knew no end. Fearful of the heat of the sun, ignorant of the seas, insulated from the heavens by the branches of the canopy, their entire cognitive and spiritual world became based on the forest. Distance and time became measured not in hours or miles but rather in the quality of the experience itself. With good hunting a trip is short, though it might be measured by a European in weeks. 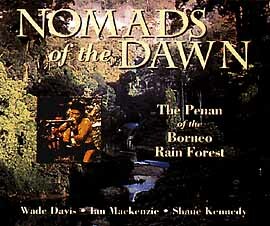 A long arduous walk is one that exposes the Penan to the sun. The length of a journey is determined in the moment, by the discovery of wild fruits, a stand of sago, the chance to kill a wild pig. The passage of time is measured by the activities of insects, the sweat bees that emerge two hours before dusk, the black cicadas that electrify the forest at precisely six in the evening. If there is a pattern to the Penan migration, it is determined by the growth cycle of the sago palm. It is a journey that may take twenty years to complete, an itinerary first described by the ancestors at a time when the earth was young and still wet with the innocence of birth. This site consists of documents linked in series containing excerpts from Nomads of the Dawn. They are best read in order, but you may use this index to jump around if you wish. The Borneo Project has new copies for sale at a modest price. Write to them with your request. Amazon.com usually has used copies (likely at an inflated price).